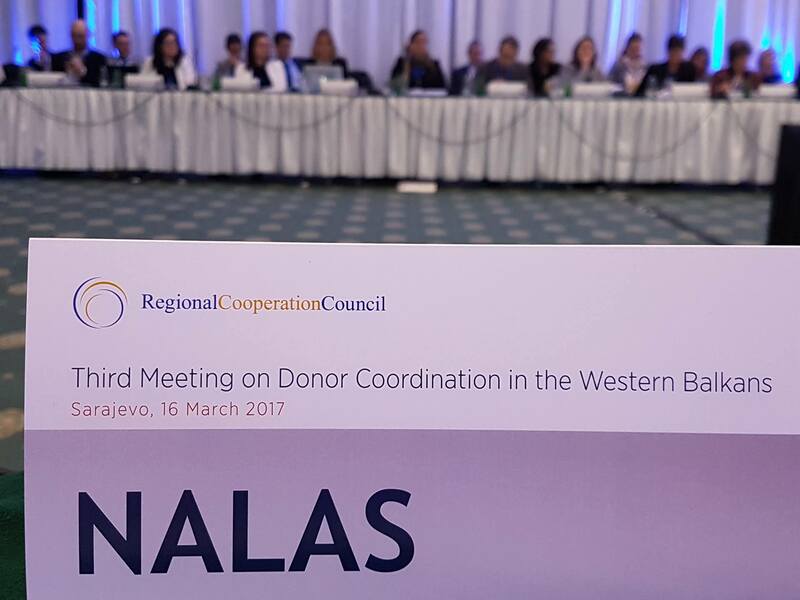 The Third Meeting on Donor Coordination in the Western Balkans, organised by the Regional Cooperation Council (RCC), Sarajevo, Bosnia and Herzegovina on 16 March 2017 brought together some 100 participants representing donors and regional organisations and opened important issues on economic development and rule of law and security. In the two panels, on (1) Economic Development: Needs and Priorities in the Region and (2) Rule of Law and Security: Achievements and Demands, donors and regional organisations presented their programs and activities. NALAS Knowledge and Communications Manager, Jelena Janevska took part in the discussions, pointing out at the important role local governments play in economic development and citizens well-being, while in the same time the public administration reform at local level in SEE is completely neglected. “The Public Administration Reform at local level was not mentioned in any of the addresses by the panellists, while it is of an immense importance”, said Ms. Janevska. “Life happens in municipalities. Improving services at local level is important and expected by citizens, but also by businesses and in this perspective, it is key for economic development. In addition, big percentage of EU aquis is implemented at local level, so local institutions need to be capable of doing so”, stated Janevska. “As the European Commission is not supporting Public Administration Reform at local level, and this is a donor coordination meeting, NALAS invites other donors to fill in the gap”, appealed Janevska. She also informed that the new NALAS strategy will focus on sustainable economic development and youth employment and that Local Governments must have a say in this area, through: removing barriers for entering the labour market and the entrepreneurship world, bridging the skills gap, access to finance, but also networking, mentoring and learning from others, etc. In NALAS network we have positive examples, such as the ones from Slovenia, that can be a good model for the region. In the discussion within the panel Rule of Law and Security: Achievements and Demands, it was mentioned that one of the 4 objectives in the new NALAS strategy will focus on stability, security and resilience, using a grassroots approach and inter-sectoral cooperation. So, we invited donors to cooperate on these issues. At the meeting, RCC shared the approved 2017-2019 SEE2020 Programing Document, where NALAS is included with 2 initiatives: 1) E-learning and 2) Innovative Financing of SEE cities, but with no financing secured.